The 2019 season (our seventh year) will begin on Sunday, April 28th at 10 a.m. Registration is closed. There's a link on the side of this page for those that are interested in joining our waiting list or would like to sub. We depleted the list quite a bit this year, so you'll likely be asked to sub/join pretty quickly. The schedule and rules are up and posted under handouts. Season six will begin on April 29th. We'll run through through the end of June. You'll be receiving emails soon about signups. If you have friends that are interested in participating, please be sure to have them sign our waiting list. We'll initially sign-up existing players and then add players as needed. We depleted the waiting list a lot last year, so there's a good chance people wanting to play this year will be able to do so. This year's champions are Orange Juice who defeated Black Ice in the final game. Thanks for a great season. There's a bunch of pictures from the final weekend of the season at our Facebook page (www.facebook.com/pembrokesoftball). Also, similar to last year, due to the Pan-Mass Kids Bike Race taking place at the high school, we need to change the times for the week of June 12th. There will be two games held at the middle school at staggered times and a third game played at 10:45 on the middle field of the high school. If you are playing at the high school, please don’t arrive before 10:15 because Learning Lane will be difficult to get down until the race is completed. Orange) (Home) vs, at Green at Middle School 9 a.m. Start Time. Black (Home) vs. Red at Middle School 10:45 Start Time. The weekend of June 19th, we'll begin the first round of the playoffs. More on that as the date draws closer. We will begin our season this Sunday. The schedule and rules are posted on the website (under handouts). Due to somebody ripping up the back field of the high school with a dirt bike, we've been asked to stay off that field for a few more weeks. The three fields we will be using to start the season are the baseball field, the middle field at the high school and the field behind the middle school. As soon as we get clearance from the town, we'll begin using the back field at the high school and stop using the baseball field. 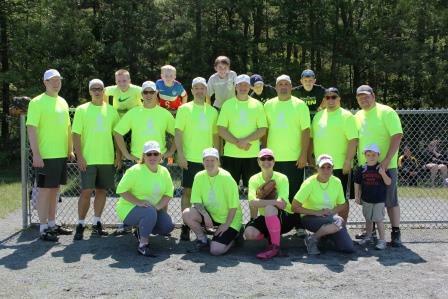 Safety Yellow (Kenny) hosts Team Blue (Chilcott) at baseball field (located at Pembroke High School. All games begin at 10 a.m. Since our league is 2/3rds men, we'll be using a guy-guy-girl batting order all the way through the lineup. No outside bats will be allowed. Only bats purchased by the league are allowed, No exceptions! Thanks and looking forward beginning the year. We received word from Pembroke Public Schools that we need to delay the start of the season one week because the high school fields were damaged over the winter and with the recent rain, they had concerns about injuries, further damaging the fields. That’s the bad news. The good news is that they also told us that we can use the softball field behind the middle school instead of using the baseball field this season. Therefore, we’ll have three softball fields and no longer have to use the baseball field.The start of the season will now be May 8th instead of May 1st. We will schedule a doubleheader one week this season (still figuring that date out) to make up for the delay of the season’s start. The coaches and some female players had a meeting tonight and discussed a few rule clarifications etc. Those changes and the schedule will be up on the website later this this week. We'll also send out a another email with opening day info. We apologize for the delay but there really wasn't a workaround that we could come up with. Season four signups are complete. We've added a handful of new people but, for the most part everybody is back from last year. If you are interested in signing up as either a sub or be added to the waiting list at the link below. Each year we have a handful of people that get injured or end up having schedule conflicts and we just go to waiting list when we need extra people. Congrats to Safety Yellow for having the best record and winning this year's championship. We were unfortunately rained out the last two weeks of the season which was a lousy way to end the year. If you haven't signed up for pickup games already, be sure to click on the link on the right-hand side. The season-ending party will once again take place at Oliveira's immediately following the games on Sunday, June 28th. We'll have a slew of free pizzas, music, cake and face-painting for the kids. Hopefully we'll have the same weather we've had for the first two parties as the party/end of season will be rain or shine. As in the past, bring your spouses and kids. There's a link on the right side of our website for those that are interested in playing pickup games over the summer and in the fall. We've tried this in the past and people's schedules and the weather have made it challenging but I wanted to give it another try. If you are interested in playing, we'll send out emails and these games will be first come/first serve and people that play can pitch in a couple of bucks each to pay the umpires. Click here to get added to that email list. This Sunday is the Pan-Mass Bike Ride for Kids and it's taking place at the high school. As part of the safety plan that the organizers and police decided on, there will be some cars parking on the baseball field. We are moving the game between the Black Ice and Blue Team to the field at North Pembroke Elementary School. Patrick was able to get that field reserved. That game will take place at 10:30 and, for those not familiar with the school, the field is on the left-hand side of the school. The address there is 72 Pilgrim Road. The other two games will be held on the softball fields. There will be one lane of traffic open on Learning Lane and there should be sufficient parking towards the end of the road. Orange and Red will be on the middle field and Green and Safety Yellow will be on the back field. I'd suggest just giving yourself a little extra time in case it's still a zoo up there. Other updates: The 2015 team pictures are up under the Photo Albums link. Lastly, there's a link on the right side of our website for those that are interested in playing pickup games over the summer and in the fall. We've tried this in the past and people's schedules and the weather have made it challenging but I wanted to give it another try. If you are interested in playing, we'll send out emails and these games will be first come/first serve and people that play can pitch in a couple of bucks each to pay the umpires. Click here to get added to that email list. The link below has the rules and regulations for 2015. Not much has changed except that we are allowing sliding again and we're also asking all teams to use the bats that we purchased. Each team has three bats of varying weights. When we did the survey last year, people wanted bats that were consistent league-wide. This was the best solution we could come up with. If things work out with them, we'll add additional bats next season. Thanks and looking forward to a great season. Welcome to season three of Pembroke Co-Ed Softball. The season kicks off on Sunday, May 3rd and will run through Sunday, June 28th. We had 88 players last season and remarkably 82 of them have returned. We've plugged in a few additional players as well. We'll again have six teams playing on the three fields and the games will begin at 10:30 a.m. Generally there's a group on one of the fields about an hour early doing some batting practice and fielding. All are welcome to take part in that. There will be sliding again this year. We'd done away with it last year but the consensus from players last year was they wanted it back. There will be no hard sliding though. We purchased some very good quality bats for each team. Some players felt there was some difference in the caliber of bat on each team, so this should level the playing field. If you are on Facebook, please "like" our page at www.facebook.com/pembrokesoftball. There is a link on here for schedule and standings. The link on the link has the schedule for each week. You can either click on which team you are on or just look at the league-wide schedule. It also lists which field you are playing on. Generally, Matt York is up there an hour early doing some batting practice and fielding on whatever field he's playing on that week. All are welcome to join. Assuming that at some point the snow decides to melt, we will begin the third season of Pembroke Over-30 Softball on Sunday, May 3rd. In the next couple of weeks we'll be opening up online registration for existing players. If there's a need for additional players after that, we'll open it up further. Some of you have likely received emails from your managers seeing if you'll be returning. If you could make sure to do respond to them so that we have a general headcount that'd be great. 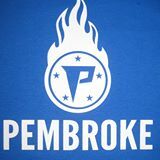 We'll again be having six teams on three fields at the Pembroke H.S. The season will run for nine weeks like in the past (we'll end June 28th). Thanks and we'll see you in the spring. The Black Ice won the softball championship for the second year in row after reeling off eight straight wins. They finished the season 8-1. Thanks to everybody that made Opening Day a success. Big wins for Vegas Gold, Orange Juice and Chilly Blue. On to game two next week. We have a website this year (www.leaguelineup.com/pembrokesoftball) thanks to Dow Lynch. The schedule is on this website. I sent out a schedule recently. The weekly match-ups will remain the same but we tweaked the fields for some of the games so that it was more evenly distributed. The games are a little earlier this year 10:30. 1) Each game, the two coaches wil confer and try to find a batting order (guy/girl etc.) that works most fairly for that particular week based on the makeup of each team on a given week. We're trying to balance it a little better than we did last year. It's not going to be perfect every week but we're trying to make it as even as possible. 2) We're doing away with sliding completely. If you slide, you're out. 3) On the middle field, if you hit a ball into the woods in right-field on the fly it's a home run. If you hit it into the woods, it's a ground-rule double. 4) We're doing away with the playoffs this year and just doing a nine-game schedule. Best regular-season record is champ. 6) You'll notice the backfield has a fairly short fence in the outfield now. For now, we'll treat anything hit over the fence as a home run. If it seems like we need to change that rule, we'll notify everybody. Lastly, please make sure you are notifying your coach if you are going to miss certain weeks. We have a list of players willing and able to substitute if the need arises, but we just need a litttle notice so we can contact them. Hello, we received a slew of new registrations today and we are temporarily suspending online registration. However, we will likely be add a few more players (especially females). If you spoke with one of the managers or organizers previously about signing up, speak with them or shoot us an email at pembrokesoftball@gmail.com. In addition, last year we had a number of people get hurt because we're old and old people get hurt playing a kids game sometimes. If you'd like to add your name to the waiting list or substitute list, you can click on the form in the upper right hand box and do so. If we have enough people express interest, we'll discuss the possibility of adding teams but logistically, it'd be tricky to do so. However, we had injuries, other commitments cause a number of substitutes to be sure we had enough players and that will likely be the case again this year. If you'd like to add your team, please fill out the form on the upper right-hand side. Thanks for your enthusiasm and understanding. 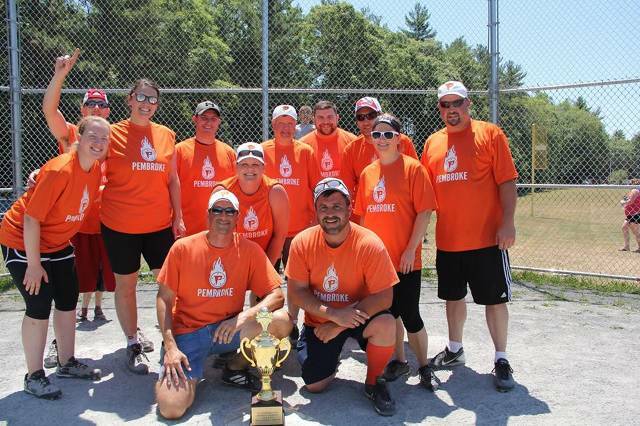 Welcome to season two of Pembroke Co-Ed Over 30 Softball. First off, a big thanks to Dow Lynch for getting this website up and running. Registration for all players is now open. You'll see the link on the right-hand side to register. You can pay by credit card, debit card or PayPal. Players that sign up will be able to do so on a first come/first serve basis, so please be sure to sign up as soon as possible. If you are a new player and have a team you'd like to be a part of, you can type that in under the notes section on the registration form. We can't guarantee that we'll be able to fulfill all requests. Some teams from last year are back almost completely and others are missing players, so we'll do the best that we can. Our intention is to keep six teams like we did last year. The season will run from May 4th thru June 29th. The games will be played on Sunday mornings again but we'll have a slightly earlier start time (probably 10:30). If you want to sign up again but don't want to be on the same team, please go sign up online and then send an email to pembrokesoftball@gmail.com to let us know. All players will receive new (and improved!) hats. All new players will also receive shirts as part of their registration fee. $50 for existing players that don't need a new shirt. $65 for existing players that need a new shirt. Thanks and looking forward to a great second season! 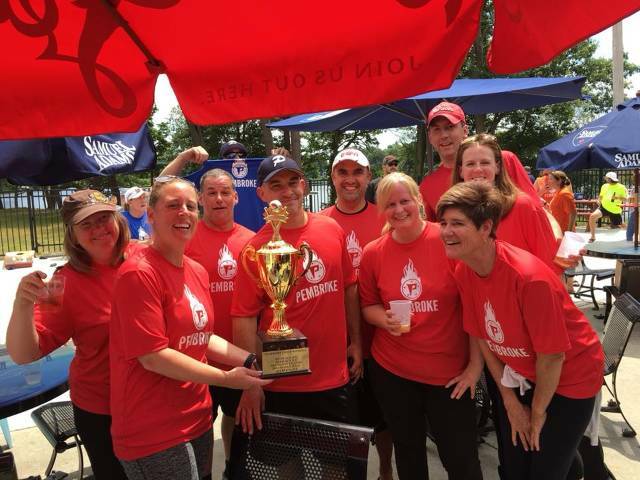 Pembroke Co-Ed Over 30 Softball League joins 20th Century, launches website! 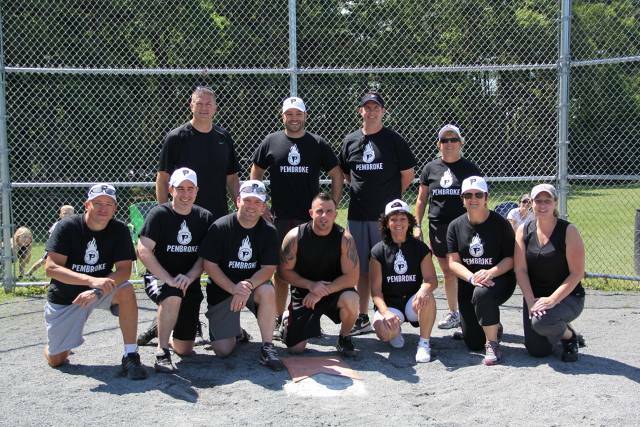 Hi folks, the Pembroke Co-Ed Over 30 Softball League is now online and ready to serve you! Stay tuned here for important info about the league as it develops!